People love animals. People love pets. 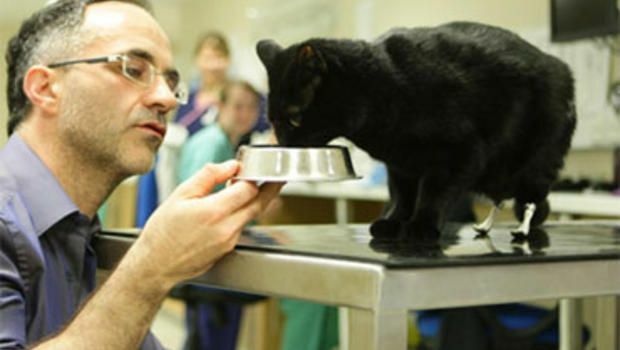 But sadly what some people don't love are the costly procedures, care, and upkeep of a pet once they get old or sickly. Some animals are sadly abandoned or left to adoption shelters once things get tough for them, but this story is different. This amazing wee cat was struck by the almost unimaginable, literally. In an accident, Oscar's back paws were cut-off by a field harvester, leaving him with poor mobility and a lesser quality of life. 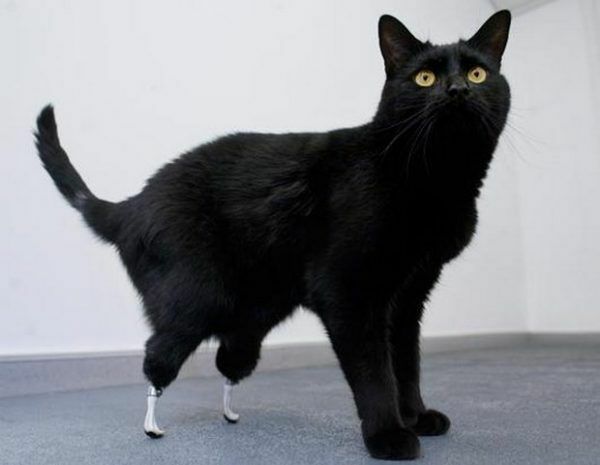 Luckily for Oscar, a miracle working vet stepped in to help him, and give him prosthetic legs. The Vet, Noel Fitzpatrick, did an amazing job fitting this curious kitty with some brand new feet, such a good job in fact, that Oscar was up and about as soon as he woke up from surgery! Oscar with his flash new feet! The feet were a great fit for Oscar, and the cat was so happy that he began climbing, jumping, and running around the vet's office, eager to test them out. He did so much on his new feet that the vets had to restrain his reach, blocking off parts of the office with rolls of paper so they could encourage the cat to rest and recover from the surgery. Noel Fitzpatrick did an amazing job with Oscar's legs, he not only gave a small cat the ability to walk and enjoy life, but he even went as far as to wrap the feet in duct tape, so that they were black, to match Oscar's coat.